A simple recipe that is perfect for a spooky Halloween party, the jack-o-lantern cocktail is as fun to look at as it is to drink. It features a tasty mix of brandy and orange with a little sparkle and includes a garnish that turns your glass into a pumpkin. The recipe is adapted from one that was developed for Hennessy Cognac. It backs off the orange juice a little, letting the brandy take more of a starring role, and it adds more ginger ale. That should give the drink a little more sweetness to offset the semi-tart citrus while making it more refreshing. You can, however, make little adjustments to any of the ingredients to get your ideal mix. In a cocktail shaker filled with ice, shake the Cognac, liqueur, and juice. Strain into an old-fashioned glass over fresh ice. Top with ginger ale. Float an orange wheel with a lime twist poked into the top. The highlight of the jack-o-lantern is the garnish. It's one of the easiest garnishes you can make and you should have no problems creating a bunch of pumpkin tops in advance of your party. Simply refrigerate your completed garnishes until they're needed. The trick is to choose a larger glass that can fit the orange wheel. You'll likely need a double rocks (old-fashioned) glass to get the diameter needed for an average orange. You can also select smaller oranges specifically for this drink. Keep in mind that you want a little room around the orange so it doesn't block you from drinking it. 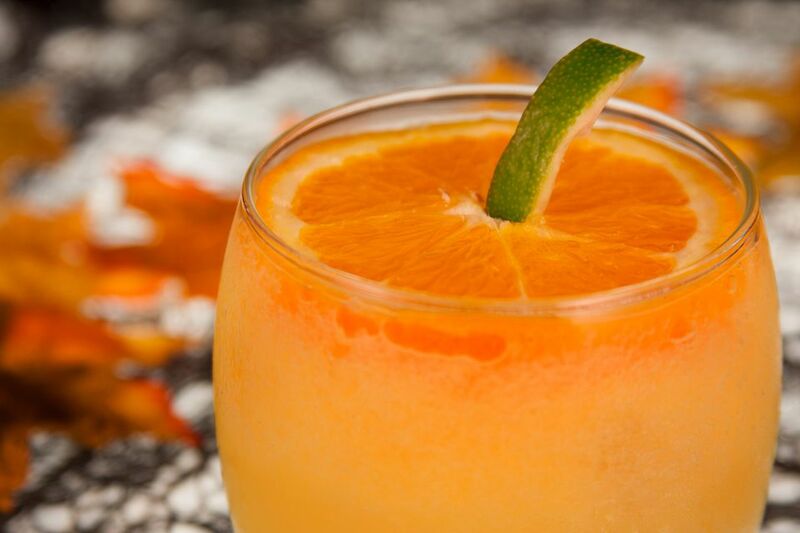 If your orange does touch the rim, you can always insert a thin sipping straw down the side. This should let you enjoy the drink while keeping your pumpkin intact. For the lime, cut a long twist from the peel then cut it into small sections to create the stems for multiple drinks. The other option is to simply cut strips of lime peel and forget the spiral. Either way, it will look great and should poke right into the center of the orange wheel. Every cocktail needs to be customized to suit your personal taste and the jack-o-lantern is no different. The recipe is a good starting point that puts more focus on the Cognac and ginger ale, leaving the orange ingredients as a background flavor. This may still be too much orange juice for some people. You may want to back off a little more on it, depending on the juice you're using. This ratio works rather well with fresh-squeezed orange juice that has the pulp removed. If you choose a store-bought orange juice with a more concentrated flavor, you may want to pour only 1/2 to 3/4 ounce. You can also customize the amount of ginger ale. If you find the drink to be a little orange heavy, simply add more soda after the first few sips and give the drink a little more life. How Strong Is a Jack-O-Lantern? As you make adjustments to the recipe, its alcohol content will change slightly. Yet, it's always going to be a relatively mild mixed drink, somewhere in the 14 percent ABV (28 proof) range. To put it into perspective, it's only slightly stronger than the average wine.